I don’t know why I’ve been avoiding learning to poach an egg all my life. Maybe because everyone makes it out to be “so difficult”. I found it to be the easiest thing I’ve recently learned! Expect to f**k up a few times at first . But that’s to be expected, it’s just food, no worries. Before you know it, you’ll be whipping them up with no troubles at all! Practice makes Perfect. We could spend a lot of time going into the politics around eggs (which I LOVE doing), from cage free to pasture raised or from cholesterol concerns to the perfect protein source…there are a lot of opinions out there around eggs. My philosophy is: Enjoy everything from nature in moderation (and sure, an occasional apple fritter is fine too!). I happen to LOVE eggs. They’re versatile, affordable (well, kind of. $8 farmer’s market pasture raised, ek!) and not to mention, packed with vitamins, minerals and protein. Whipped it up again for a late lunch yesterday. 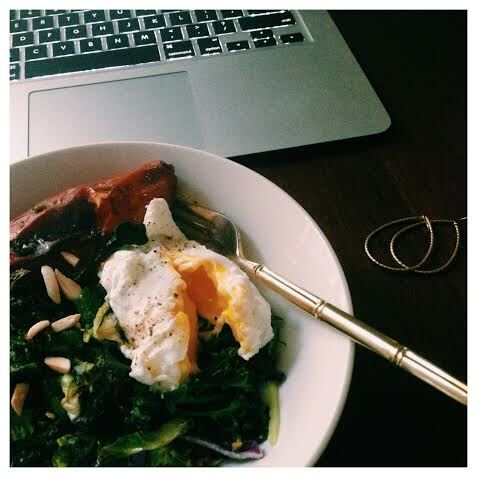 Earrings off, computer aside… hello deliciousness!!!! Think I’ll make it again today! Today is my favorite day of the year! It’s a day that represents what I love most: family and friends coming together over healthy home cookin- amen! This year was a little different than my past 27… my mom has decided (to my pleasant surprise) that it’s time to pass down the turkey torch to me. I am so thrilled to be able to carry on our family tradition of hosting dinner for 20+ family members, neighbors and friends. I hosted my first Thanksgiving for 15 Italian friends when I was 19 living in Milan. I didn’t have an oven so I’d jet across our courtyard and up three flights of stairs to my friend’s apartment to baste the turkey. Just imagine a little American carrying a turkey through Milan, sigh. So, this year in my parent’s kitchen and with my mom’s expertise it’s going to be a walk in the park. PREP ladies and it’s what I teach in my cooking classes! Yesterday my mom and I (plus pops was a huge help too!) prepared everything. All we have to do today is throw things in the oven. I’m telling you, I won’t even need to get out a knife today if you can beleive it or not. Hosting a dinner for 20+ people should not be stressful, it’s something to be enjoyed and loved. Wishing everyone a wonderful thanksgiving. I am so grateful for all of the kind, loving and supportive people in my life. plus healthy appetizers! What better way to spend your Friday night!? Pilates Pro Works hosted a party Friday and I was so thrilled to have my first official Stiletto & Spice event with people who share the same philosophy for a healthy lifestyle as me: Exercising, Wine, Friends, Natural Whole Foods! Warm first 2 in saucepan. Add vanilla. Combine with crisps in a big bowl. Press into a lined pan. Top with 2 cups chopped peanuts nuts. Roast Beets in Foil – cut carrots into pieces, toss with evoo and s&p. 400 cooking times will vary. Recipes can be made ahead and enjoyed all week! 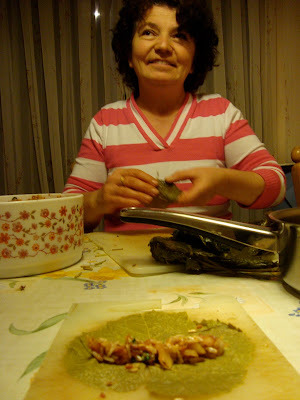 Not only is Muruvvet a wonderful person, she is a wonderful cook! Everyday she would whip up something so tasty, and still manage to make it look so effortless. Like any authentic home cooking, what makes it so delicious is the cook’s familiarity of the cuisine, and of course their true love and appreciation for their culture’s food. There are many reason why I love Turkish cuisine, for example, dishes are based on local ingredients and what’s in season, they use whole ingredients and know exactly where their animal products come from. Sounds the way it should be, pretty basic, right? Turkish woman put a lot of time and effort into their cooking and don’t cut any corners in the kitchen, for example they make bread weekly if not daily, soak beans over night, chop onions by hand, and buy fish, chickens and even lamb whole… the list goes on. 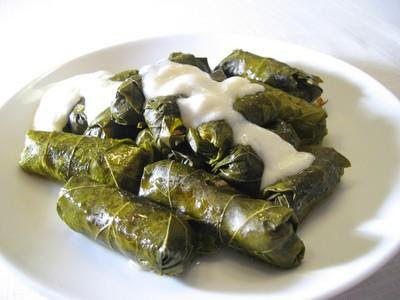 The term sarma comes from the Turkish verb “sarmak,” which means to roll. 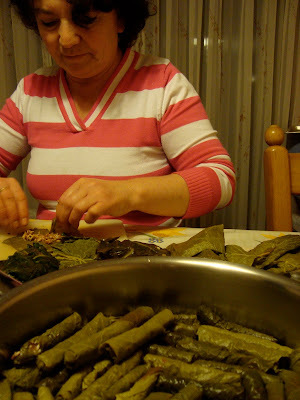 Sarma is pretty much the same at the Greek dolma, the only difference is the name. In Turkish, dolma means “stuffed.” Therefore, Turkish dolmas are things like stuffed peppers, artichokes, eggplants, etc. dissolve the tablespoon of tomato paste in about 3 T of hot water. Add to your rice mixture and mix well. 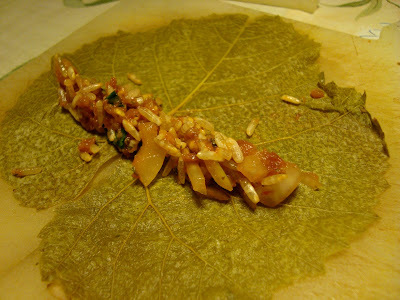 Prepare a your cooking pot by putting any of the grape leaves that are broken or too torn up to use along the bottom- this keeps your sarmas from sticking to the pot. Place about a spoonful of the filling down. 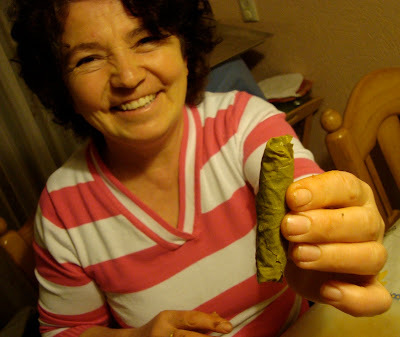 Fold over the sides and then roll up. Continue until all your leaves or filling are finished. Add about 2 T olive oil, your lemon juice and just enough water to barely cover the sarmas. This part cracks me up- place a plate on top of your sarmas- this keeps them from moving. Cover with the pots lid and cook on low heat for 35-45 minutes.